The much-boasted staging is marred by obsolete contrivances which would astonish us at the Lyceum as much as a return to candle-lighting or half-price at nine o'clock. Mr Mansfield playing Richard III in the dress of Garrick, or Mr Irving Hamlet in that of Kemble, would seem modern and original compared with the unspeakable ballroom costume which Madame Materna dons to fascinate Parsifal in the second act. The magic flower garden would be simply the most horribly vulgar and foolish transformation scene ever allowed to escape from a provincial pantomime, were it not recommended to mercy by a certain enormous naïveté and a pleasantly childish love of magnified red blossoms and trailing creepers. Above: Sketch of the Grail Shrine by Anton Schnittenheim, Bayreuth 1882. 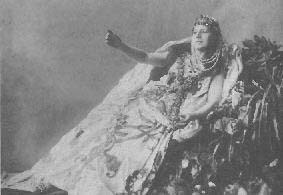 Left: Marianne Brandt as Kundry in Act 2, Bayreuth 1882, reclining on the "Gower St. sofa". ©Richard- Wagner- Gedenkstätte. As to the canvas set piece and Gower-st. sofa visibly pulled on to the stage with Madame Materna seductively reposed on it, the steam from a copper under the boards which filled the house with a smell of laundry and melted axillary gutta-percha linings, the indescribable impossibility of the wigs and beards, the characterless historical-school draperies of the knights, the obvious wire connexion of the electric light which glowed in the ruby bowl of the Holy Grail, and the senseless violation of Wagner's directions by allowing Gurnemanz and Parsifal to walk off the stage whilst the panoramic change of scene was taking place in the first act (obviously the absence of the two men who are supposed to be traversing the landscape reduces the exhibition to the alternative absurdities of the trees taking a walk or the auditorium turning round): all these faults show the danger of allowing to any theatre, however imposing its associations, the ruinous privilege of exemption from vigilant and implacable criticism. 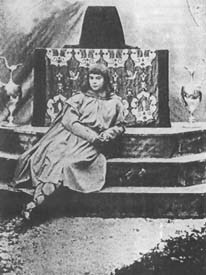 The performance of Parsifal on Sunday last suffered additionally from Herr Grüning executing a hornpipe on the appearance of Klingsor with the sacred spear; but this was introduced not as an act of whimsical defiance, but under pressure of the desperate necessity of disentangling Parsifal's ankle from the snapped string on which the spear was presently to have flown at him. Right: Flower Maiden costume by Paul von Joukowsky, Bayreuth 1882. ©Richard- Wagner- Gedenkstätte. Impressive as the first Grail scene is, nine-tenths of its effect would be lost without the "innocent fool" gazing dumbly at it in the corner, only to be hustled out as a goose when it is over. His appearance on the rampart of Klingsor's castle, looking down in wonder at the flower maidens in the enchanted garden, is also a memorable point. And that long kiss of Kundry's from which he learns so much is one of those pregnant simplicities which stare the world in the face for centuries and yet are never pointed out except by great men. 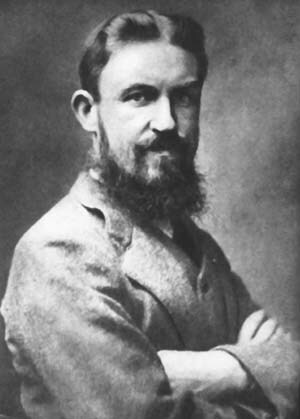 The work produced a great effect - an effect in some cases of disgust and repulsion, in others of awe and even of ecstasy; but in all cases a powerful effect. The perfect smoothness with which the panoramic changes of scenery in the first and third acts worked, the clever changes from dusk to full light, the beauty of the temple of the Grail, the smooth and thoroughly rehearsed choral singing, the magic of the orchestra, and above all, of course, that prodigious coup de théâtre, the celebration of the Holy Communion on the stage, with the sacred chalice glowing with ruby light, and the Holy Ghost descending in the form of a dove in dazzling celestial radiance, could not fail to affect very deeply an audience of the somewhat cathedrally class (if I may use the expression) which alone can afford to go to Bayreuth. There was an English bishop present yesterday. I shall not mention his see, lest I should get him into trouble. 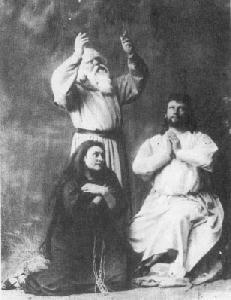 Left: Amalie Materna, Emil Scaria and Hermann Winkelmann. © Richard- Wagner- Gedenkstätte. The bass, who was rather flustered, perhaps from nervousness, was especially brutal in his treatment of the music of Gurnemanz; and it struck me that if he had been a trombone player in the band, instead of the singer, the conductor, Levi of Munich, would have remonstrated. Indeed, I presently heard a trombone player, who was helping with the fanfares outside the theatre between the acts, pulled up by the sub-conductor for being 'a little too strong'. Accordingly, having the opportunity of exchanging a few words with Levi afterwards, I expressed my opinion about the bass in question. Levi appeared surprised and, declaring that the singer had the best bass voice in Germany, challenged me to find anyone who could sing the part better, to which I could only respond with sufficient emphasis by offering to sing it better myself, upon which he gave me up as a lunatic.